SIX is uplifting and strong, a true testament to what women are capable of. ‘Divorced, beheaded, died…’ We all know how it goes, but do you think you know everything about Henry VIII’s six wives? Think again, as SIX will make you reconsider your entire Tudor knowledge. A new musical by Toby Marlow & Lucy Moss, SIX gives a voice to Henry’s wives in the form of a modern rock concert, complete with a live, four-woman band to accompany. At first this may seem like a completely absurd concept, and yet this show is utter genius. Before our six leading ladies come on, as pre-show entertainment we find ourselves listening to modern songs, such as ‘Bang Bang’ by Jesse J, Ariana Grande and Nicki Minaj and ‘Firework’ by Katy Perry, played on an unseen lute. This merging of the Tudor and the modern becomes a recurring theme throughout the show and is absolutely inspired. Immediately, we know that this isn’t a show taking itself too seriously, and we are about to have some fun. The all-female band, known as the ‘Ladies in Waiting’, soon take to the stage (and are all incredibly talented), before we meet the queens themselves. With a power which can only come from royalty, Catherine of Aragon (Jarneia Richard-Noel), Anne Boleyn (Millie O’Connell), Jane Seymour (Natalie Paris), Anna of Cleves (Alexia McIntosh), Katherine Howard (Aimee Atkinson) and Catherine Parr (Maiya Quansah-Breed) appear one by one in their individual spotlights, giving off the fiercest vibes I have ever witnessed on a stage. Launching straight into their first song, Ex-Wives, we see more Tudor references, including a ‘Greensleeves’ motif included in the modern track, as well as in the queens’ outfits, all of them wearing modernised, glamorised yet still Tudor-esque attire along with some incredible glittery and kickass high-heeled boots. The sass and the humour of this show shine through right from the start, as we learn that we are about to witness some ‘Herstory’, and all six queens will tell their tales, fighting it out in a competition to become leader of the girl group. The winner? The queen who had to put up with the most ‘BS’ from darling King Henry. As each queen performed her solo song, each in a distinct style of a different modern pop artist, ranging from the likes of Beyoncé and Adele to Lily Allen and Alicia Keys, it became increasingly difficult to choose a favourite. 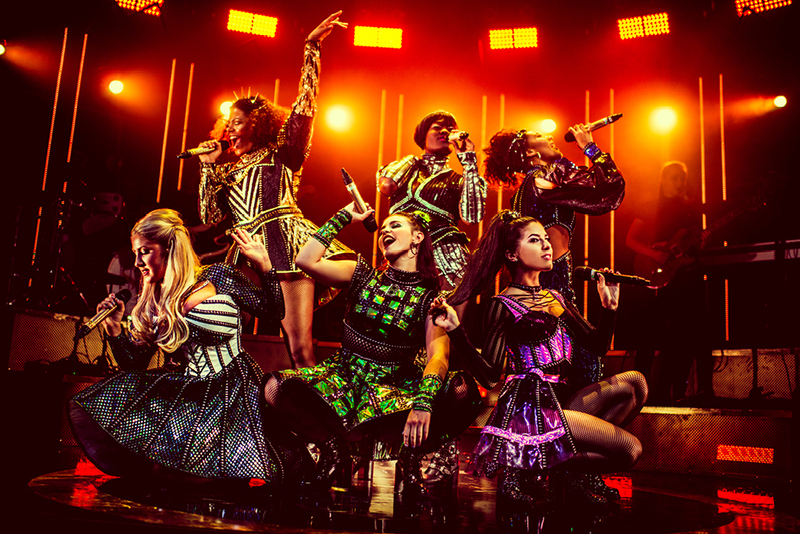 Each queen’s character had a unique personality, and all six actresses had impressive belters of voices to match, as they each rocked their individual tracks and delivered some real history on the queen they were portraying. Anna of Cleves (reclaiming her German name here, rather than Anne), in particular, is empowered here more than ever before. Once known as the horse-faced reject, she is realised here as a sassy, self-professed gold digger who manages to come out of her divorce with Henry with her own palace, over which she has free reign – and she couldn’t be happier. Each queen carries a distinct vocal quality which at once separates them and makes them equally extraordinary. I really wasn’t expecting to be so blown away by this production, but it is an inspired, wonderfully feminist retelling of history, pushing forward the real stories behind these women. It even touched upon important and relevant topics, such as sexual abuse and miscarriage, bringing a more sombre, yet meaningful tone into play. The format of the concert, with a relatively short running time of 75 minutes with no interval, is very effective and ensures the show runs smoothly from start to finish, whilst leaving the audience wanting more; the standing ovation across the whole auditorium speaks for itself. You will leave the theatre feeling uplifted and capable of anything. It is remarkable to see these famous female figures reclaiming history in such a powerful, impactful way, and one of the lines in the final song really sums up this sentiment: while ‘pondering’ over the real strength of Henry VIII’s reign, the queens ask, ‘Could it be his extraordinarily strong six wives?’ Absolutely. SIX is running at NST Campus until Saturday 17th November.